An entertainment personality, fresh from various surgeries (augmentations, alterations, etc. ), recently opined in an interview, “But in the end, this is just a shell.” It was a very revealing cultural moment. The body is “just a shell” but worthy of tens of thousands of dollars to alter its appearance. It has been observed that modern man lives his life as a hedonist and dies like a Platonist. The hedonist believes that life is defined by pleasure (particularly physical pleasure). The Platonist believes that the body and the material world are but passing moments – only the non-physical is real and of value. Among modern Christians this same cultural attitude is too frequently common. We gage the value and desirability of many things (sometimes including worship) on the basis of the pleasure we receive. For some, “edifying” and “enjoyable,” are too often the same thing. There has long been a bifurcation within some forms of Christianity between “spiritual” and “physical.” The use of physical actions, incense, etc. (any form of ritual), is immediately dubbed “empty ritual” by some. It’s as though the word “ritual” only comes with the modifier “empty.” Faith is considered something that has no physical content. There have been other bifurcations in history – where the body was seen as the enemy of the spiritual life and in which extreme forms of asceticism were encouraged for reasons that bordered on Manicheeism (a heresy that taught that matter was evil). The body is not “just the shell.” Properly understood, the human person is both body and soul – neither are the fullness of the person alone. It is in this sense that the Church teaches the necessity of the resurrection of the body. That at death the soul is departs from the body is the understanding of the Church. But it also understands that though the soul “is in the hands of God” it enjoys an anticipation of the life to come – rather than the fullness of the life to come. The fullness awaits our fullness – the resurrection of the body. For we know that the whole creation groans and labors with birth pangs together until now. Not only that, but we also who have the firstfruits of the Spirit, even we ourselves groan within ourselves, eagerly waiting for the adoption, the redemption of our body (Romans 8:22-23). In the meantime – if our hope includes the redemption of our body – how can our daily life as Christians ignore the spiritual reality of the body? Fasting and other bodily acts of devotion to God are normal for a Christian living in the body. The body does not pray alone, but neither does the soul. In the same manner, it matters what we do with the body. It is not a shell whose function is to become as attractive as possible to other shells. Body and soul are united: what is done with one effects the other. Thus the “beauty” of the soul, as it is adorned with virtue and kindness, has an effect on the body. It is difficult to describe the beauty of the soul that radiates from the body, but I have seen it numerous times. In the same manner, the crass treatment of the body in which it is made to serve vices rather than virtues, works not beauty in the soul – but its opposite. I have seen this many times – and in my own mirror. The body is not a shell. It is created to bear the fullness of the image of Christ. I have heard some (at funerals) look at a body and say, “That is not him.” It is “him” in the same manner that the soul is “him.” The person is body and soul. For this very reason the Orthodox faith is careful in its teaching regarding the honor that is due to the body even in death. Though it rests in hope – it rests awaiting a hope that we cannot begin to imagine. If God will so honor it – how can we not? My body is not a shell. 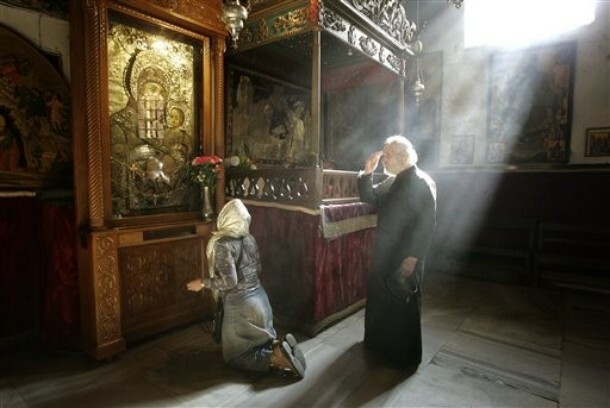 This entry was posted on February 19, 2010 at 2:00 pm and is filed under Orthodox Christianity. You can follow any responses to this entry through the RSS 2.0 feed. You can leave a response, or trackback from your own site. thank you, father stephen, for your wisdom and great insight. how does the orthodox church feel about cremation? Thank you so much for sharing this concept in a clear manner. Our idea in the US of separating the physical from the spiritual troubles me and confuses at times, you have helped to remind me of one of the important aspects of Christianity for me and my departed loved ones. I am in need of much instruction and you have helped me very much with your site. Thank you, Father. When my mother died, one of my uncles (one of my dad’s brothers) tried to “comfort” me with that line, “That’s not your mother in the coffin.” If I had not been so deeply grieving for my mother, I would have made that into a joke — “Oh no! Who is it then, and what did they do with my mom?” As it was, I tried to correct him by insisting that it was *part* of her. I often wonder why Christians influenced by this error think that the Resurrection of Christ was significant, if the body doesn’t matter? And sometimes I wonder if they believe that the Resurrection really took place at all. Another place this error comes out in force is in science fiction, which strangely tends to combine materialism (there is nothing to us but our physical bodies) in one episode with Platonism (our bodies are merely a shell) in the next episode. Easton, in case Fr. Stephen doesn’t get back right away, the Orthodox church doesn’t practice cremation because of what this message speaks of. The duality you speak of has an odd impact on how we think of virtue and what we think as vice. For example, sins become something “stupid.” We ask, “What were you thinking?” A good act shows we are “smart.” Children are told to avoid certain behaviors because they are “better than that.” (On scant evidence, most times). It makes news when anyone doesn’t follow this script. I was startled to hear part of the Tiger Woods press conference today. He was direct and apologetic and blamed himself for wrongs. The language was stunning because it is heard so seldom in public discourse. May God have mercy on me, a sinner. The Orthodox Church in Japan allows cremation because of government regulations. Elsewhere, cremation is not allowed (ashes are not brought into the Church and the full funeral is not performed. The Church seeks to discourage this practice – though modern pressures (mostly economic) have been raising the question in different ways. It is not a matter of canon (I do not think) but is clearly a matter of Church teaching (where possible). Your thoughts are quite to the point. Imagine Mary and the disciples standing around the body of Jesus after the crucifixion and saying, “This is not him.” Such a meditation, I think, should bring us back to our (Christian) senses. I was struck by the same thing in the press conference. Intriguing thoughts and I appreciate you sharing. Although I am not Orthodox, I have found your blog over the past couple of years heart felt but more importantly enlightening. Thanh you. I wonder why a person would want to die like a Platonist if they had the option to die like a hedonist. I would guess that it is the same religion; both young hedonism and old Platonism worship comfort. I’m also guessing that after a life of abusing the body they want some peace, as if peace were a disembodied state and wasn’t associated with the material world. Is there a version of peace that is embodied but doesn’t just look like finding one’s comfort? It seems that Christianity will never be able to rid itself completely of Dualism, at least not in this world. I have had a difficult time dealing with my father’s wish to be cremated. Mostly because my Mother who has no desire for cremation will follow him, to be beside him when she passes. Since he was placed in a columbarium (his ashes were spread in a garden) at an Episcopal church – she will also be cremated. I have to place all my faith that God, who created us will have mercy in this situation. Much like our Japanese Orthodox must. Nothing was ever said about the body being important in the Resurrection or the Resurrection of Christ. Modernity has indeed knocked us off of the pedestal of human exceptionalism because we have both body & soul and has remade us into shells, equal to other mammals. I am with you – my body is not a shell. Leah, I can relate to your feelings. I have a sister in law (non-Orthodox Christian) who was cremated for precisely the reasons that have been raised in this post and comments. It strikes me that the Church’s teaching, following the Holy Spirit, is certainly for our benefit, not God’s. The Creator Who brought the entire world into existence from nothing can as easily restore a body from ashes as from bones or even dust! But treating a loved one’s body with the respect and dignity due the whole person helps us to retain a full sense of our biblical personhood, to honor the bonds of love that are “stronger than death,” to respect the irrevocable connection between body and soul, and to underscore the Christian’s hope in the resurrection of the body. That personhood and not economics should take precedence in our thinking and decisions strikes me also as one of the profound messages of the Gospel in the story of the Gadarene Demoniac. Jesus cast out a multitude of demons from this tormented man and allowed them to enter and destroy a herd of pigs (the livelihood of the community) in order to save just one human person. He could have denied the demons this opportunity and just ordered them to leave as He did many others, but He chose not to, and it seems to me it was in order to demonstrate at least this much. Thanks for sharing. The rejection of Platonic dualism so present in evangelical teaching has been one of the things that has led me to explore Orthodoxy. Given the respect given the body after death, what are Orthodox teachings on organ donation? I myself do not think of cremation as presenting particular problems for resurrection. Even in the early fathers, the problems of “digested” saints (some were fed to lions) was not an unusual thought. Thus our understanding of resurrection is clearly of such a nature that the state of the body (most have long ago turned to dust that is indistinguishable from ashes – and most human life that has existed is long ago ceased to be intact. The Church’s present insistence and practice is the theological consistency of properly honoring the body – as body. I do not think, in the final analysis, that we are saying more than that – the Japanese Orthodox – are presented with no danger (or I’ve not heard any argument that they are). My thoughts in this post are perhaps meant to suggest thoughts about what it means to “be” a body (and not just “have” one) – and what that means for us as Christians. That fact is certainly connected with the Church’s attitudes towards cremation – though that’s not my main concern in writing. I have buried and shared in the ministry of the dying for over 400 people in my years of ministry – nearly 300 of those in hospice care. I have thus spent more time with dead bodies than many people (probably not nurses or others in caring positions). It’s made me think a lot about this, including what does it mean to look at a body and think of it as being as much “the person” as I would of the soul. I don’t think I’m through meditating on this. The reality of it, frankly, is quite outside our culture and thus bears lots of thought (not so much reason). I understand that it is not a shell. I suspect that I don’t understand fully everything that it is. Organ donation is allowed – so I have been taught. This bifurcation seems to be particularly prevalent in American culture, where it seems that many people choose one extreme or the other: obsessing over and perfecting their bodies to no end, or neglecting their health altogether. A proper respect for the body seems very rare. I’ve also been thinking about this question in terms of modesty lately. I found myself in several situations where single men I know were priding themselves on having such a progressive view of women- particularly contrasting themselves to Muslim men who cover and oppress their women etc. Of course these same “progressive” men would have no problem buying magazines with naked women in them, buying a certain brand of vodka because a naked woman is drinking it in an ad, the list goes on. Now, while I very much value the freedom that women enjoy in the west, I can’t help but see how we’re exploited by it at the same time. There seems to be a false correlation made between covering with oppression and exposing with liberation. While I’m not sure exactly how to read the Muslim tradition of covering the head, and I’m certainly not about to adopt it, it did strike me recently that one could make the argument that there is something respectful here- that women aren’t being exposed and flaunted as objects (though perhaps they’re being controlled as such- particularly in places like Iran.) But I think in the west we face an oppression of a different kind, and I think it’s interesting that we would see a woman with her head covered in a liberal country and automatically assume that she is submissive and oppressed. It’s as though people think we can sell a woman’s body without selling women. Or that by covering the body, we’re necessarily covering the spirit. I personally find myself becoming more modest. It’s not that I’m embarrassed or ashamed of my body. It’s really the opposite- why cast pearls before swine..? One of the consequences of not holding the body in its proper perspective is that we begin to be full of contradictions. Modernity is, in many ways, a mass of contradictions. It is built on a faulty foundation in which a number of things that are not true are assumed to be true and the result never quite makes sense. You have accurately pointed one of those contradictions as well as demonstrated how the sanity of the faith begins to draw us back to a wholeness in Christ. May He bless you. Thank you Fr. Stephen, all of what you say is very comforting. When it comes down to it, my difficulty is the realization that I wasn’t a very good example to them, early on of what a Christian is or should be, I am doing my best to rectify that now, by living the faith, loving them and praying for them. Whatever the truth of the actual situation, God is mercy and love. I was blessed to be with my dad when he was dying. Blessed to sit vigil and pray the Psalms and help him and my mom. When he passed, I was honored to wash his face, comb his hair and dress him before the funeral home came. We got to spend some time with him. I honored him, the best way I could and stayed with him while they wrapped him up and placed him on the gurney. What is surprising in all of this is that my mom, still in shock, was surprised that such care should be taken at all; but she didn’t know what to do and that is understandable. When we had finished, she was so glad that we did take such care of him and that is a blessing. Today’s America has no idea what to do with death – except to show it end violently or purposefully on television or the movies. Gone are the days of being with and caring for our dead in any tangible way. Wakes used to be held with the beloved family member dressed and laid out on the dining room table, for a certain number of days in case they “awoke!” Hence the term, “wake”. Actual death was uncertain. But the physical act of caring for the body of your loved one and even placing them on the “altar of your home (tables are altars which is why your Grandma told you never to sit on the table) – has passed with the creation of death industry. There is too much distance with death now. Thank God for hospice which allowed us to be home with my dad and to experience such an important moment in his life in private. Leah, thank you. I think more frequently about the fact that this time is coming in my life, too, as my parents will both turn 80 next year (though among the youngest 80 year olds you will ever meet! :-)). I pray I and my siblings will have the opportunity to honor them in this way as well. It also makes me think about how to do a better job of that while they are still living. Bishop Kallistos sometimes tells about a prof in London he knows who is a Platonist. The one liner is that his students say the professor “Does not go for a walk, he takes his body for a walk”. Fr. Florovsky talks about this very well — on the immortality of the soul? he mentions that it was precisely because of what Christians believed about the body (He mentions one Platonist who was repulsed at the idea of sitting for a statue to be made of him; the idea of a visual monument to such a thing as bodily appearance!) that Platonists often refused to be Christians. The *real* Paltonists understood the difference. For myself I simply ask, if this body isn’t ME, who exactly is using my VISA?? Should I call the police? Great stories! You lightened by day! “It has been observed that modern man lives his life as a hedonist and dies like a Platonist”. What/who is the primary source of this observation? Have you read this somewhere? It is not original with me, but I cannot find the original citation. Fr. Weber said that (on Ancient Faith Radio podcast titled Jottings from a Holy Mountain I believe) that Orthodoxy is not so much interested in the immortality of the soul as in the resurrection of the body. It was only when I recognized in myself that the life of the body is the s(S)pirit, that I realised what a profound statement this was. There is far too little thought on the body within Christian thought. I’ve not read J.P.II’s book on the body, but I’m not very sanguine about finding what I’m looking for there. R.C. theology has become far less concerned with the body (as a means of discipline) are far too concerned (it seems to me) with the body as sexual vehicle. But I’d be glad to be surprised. On EWTN the concept of the soul was discussed by someone and in passing the person being interviewed mentioned a psychologist who had mused “What if the brain is simply a transmission mechanism for the mind”. I’ve pondered this for some time. What if the soul, which is united with the body at conception, is not thought of as a product of the brain but rather something manifest through the brain. In other words the spiritual is simply manifest thru the material in a mystic union. All cultures express this in different ways. The expression of “the heart” wherein the soul and the heart are compared is one. Some native american tribes even thought the soul as manifest in the bladder 🙂 and today we tend to think of the soul in terms of the mind. The modern laughs at the thought of the heart or bladder because thats not where the sentient is. But in truth we don’t grasp the brain at all. We simply see activity, like we see heartbeats, and cannot explain in any meaningful detail how the mind works. All these are an attemp to inject the spiritual into a purely material reference, and they just pick different organs to describe it. That leaves us unable to grasp how the soul exists after death because we tend to think purely materially and cannot understand how part of the material lives on. Its hard to fully express here what I’m trying to say. To me once I start thinking this way so much of mystery become clearer, yet still mystery. Have I left the reservation or is this in line with any eastern Christian thinking of the ancients ? this is when i start arguing with myself. reason looks at all the different people in the world–some born with physical problems, some with mental problems–some extremely poor–some into abusive homes–no fault of their own–no wrong choices or consequences involved. my reasoning says–it’s completely genetic and the luck of the draw and god “lets it be”. then my heart comes back and says “god is good”. this could not be. i can grasp our mistakes leading to consequences. it’s the suffering of innocents that my reasoning questions. sometimes it seems to be chaotic . i’m sure this is where faith in a good god has to take over. Maybe half-way off the reservation. There are things the fathers never quite thought because they were no posed the same questions as we, and yet they remain authoritatively helpful. It is not a mystery we need to understand, but it’s useful to gather a feel. The soul and the body are quite united (in life) and not very discernibly separate (though the Scripture speaks of the Word of the Spirit being sharper than any two-edged sword, piercing asunder even the soul from the spirit, which is indeed sharp. But we have seen a body without a soul, though never a soul without a body. So it’s really hard to contemplate these things. It is first useful to simply quit thinking of the soul as the “ghost in the machine.” Though clearly has much to do with the brain, and possibly other things. But we are quite able to see in certain forms of imaging, direct chemical correlations between thought and chemical reactions in certain areas of the brain. That is not to reduce one to the other. But it is useful as a modern to be stretched, and to realize that much of the thought that many Christians have traditionally had in this area have been Platonist rather than Christian. The recurring Biblical phrase, “he was gathered to his fathers” makes me think that we may be more united to our ancestors, and less distinct from them, during the intermediate state than we are incarnate or after the resurrection. You took the question right from my head. 🙂 With all this talk of Platonist/Platonism, I want a clear definition, not what I think y’all mean. Anyway, I’d appreciate some clarification. Words, afterall, have meaning. Often, we toss about words thinking that our interlocutors understand what we mean by them, all the while not realizing that the meaning of the term is not quite quite unanaimous.